In April this year, I conducted the fifth annual survey of Swedish bloggers and blog readers. The survey called BlogSweden 5, included a total of 2,251 respondents, out of which 94% had at least one blog. One of the new questions this year was about why people choose to follow brands on Twitter and become a fan, or like, brands on Facebook. Last year Razorfish surveyed 1,000 “connected consumers” about, among other things, why they “friended” brands or followed them on Twitter. The responses indicated that the primary reason was to get exclusive deals or offerings. The respondents in my survey also included internet users under the age of 18 and over 55, which the Razorfish study did not. But we also follow brands on Twitter or Facebook to get deals or information before other people. Although the feeling of exclusivity might get lost if you are one of a million fans of the same brand, it still is a very good sign for marketers. The responses suggest that people who follow your brand on social media are already loyal customers or are interested in becoming customers. Consumers are telling brands that they wamt to buy from you and they want to get more information about your company and products. So marketers should take note and start using social media as channels for building engagement among key audiences. 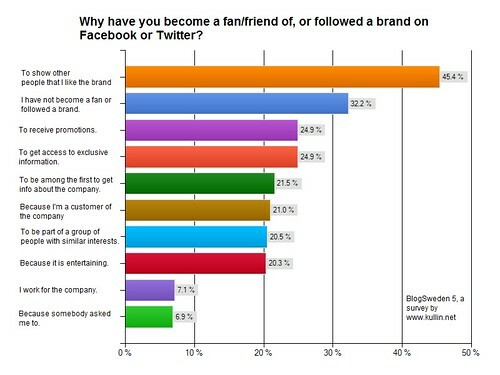 A third (32.2%) of the respondents in the survey had not become a fan of or followed a brand on Twitter or Facebook. Pingback: Hvorfor følger vi merkevarer på Facebook og Twitter? Previous Previous post: Why do I still blog?